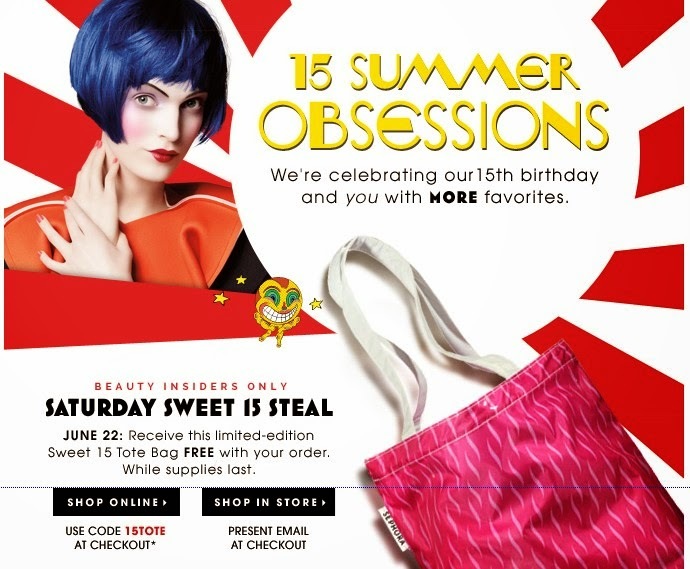 15 SUMMER OBSESSIONS - Sephora is celebrating their 15th birthday by giving YOU more favorites. See below for details or check out Sephora.com for more information as well. * Available online and in Sephora retail stores. Not available in Canadian stores. The Sweet 15 Tote (13.25"W x 11.5"H x 4"D) is free with any purchase of $25 USD or more. Valid while supplies last, quantities are limited. Not valid on previous purchases, or purchases of eGift certificates or gift cards. Cannot be used in conjunction with other promotion codes. This offer is subject to change, alteration, or termination by Sephora in its sole discretion at any time. Online: Enter code 15TOTE in the promotion code box during Sephora.com checkout. In store: Mention or present the copy of the email. ** You can confirm your chosen samples during checkout. Only one of each sample can be added per order. Substitutions will be made for out-of-stock samples.